For too long potatoes were the unsung heroes of both the vegetable garden and the kitchen. Everyone grew them because they were easy and everyone ate them because they acted as ballast for so many dishes. People didn’t really consider which variety they were eating and only Jersey Royals ever received any praise. When they were first introduced into Europe potatoes were mistrusted as a reliable food, with people preferring wheat as their staple. Many weren’t sure what they were, calling them earth truffles or earth apples in an attempt to link them with a food they recognised. All that has now changed, and today we have a huge variety of potatoes to choose from. Potatoes, and the dishes you can cook with them, reflect the seasons in just the same way as asparagus and strawberries. Certainly, you can buy ‘new’ potatoes in November, but surely one of the charms of autumn and winter is big, hearty baked potatoes or fluffy mash? 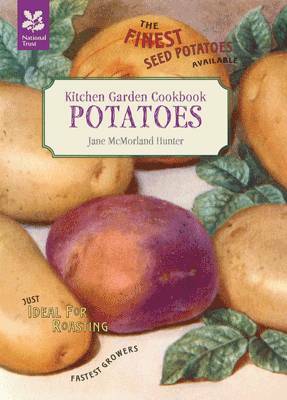 If you grow your own potatoes, you will appreciate the subtle changes in them as the year progresses and, as this book shows, you only need a tiny space to get a very satisfactory crop. The humble potato is packed with potential. They may seem ordinary, but that does not make them any less important. Technology can give us many amazing things, but the latest electronic gizmo cannot compare with a helping of chips.